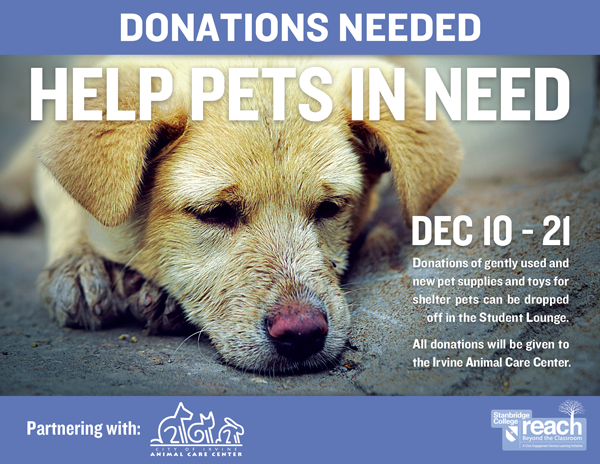 Stanbridge College REACH is hosting a two-week long Pet Food and Supplies Drive for homeless or shelter pets in Irvine starting Monday, December 10th. Help us take care of our furry friends this holiday season by donating new or gently used items to the Irvine Animal Care Center. The Irvine Animal Care Center is the largest pro-humane animal shelter in Orange County, and receives nearly 4,500 animals each year. These animals are displaced from their homes or discarded from owners who can’t afford or manage them. Donations of gently used and new pet supplies and toys for shelter pets can be dropped off in the Student Lounge. The Irvine Animal Care Center needs a wide variety of supplies for all aspects of their operations. If you are able to, please donate items for their animals as well as supplies for their office and daily operations including sharpie pens, post-it notes, clip boards, dish soap and hand sanitizer. To view a complete list of donation items please click here for the Irvine Animal Care Center Wish List.